When we go camping, we have to stay in a cabin. Namine had a tracheostomy breathing tube when she was a baby, and even though she no longer needs one, it took a toll on her that will last a long time, if not her entire life. Namine has what her doctor calls “lung disease,” but it’s not technically a disease. It’s a weakening of the lungs, muscles in the airway, and immune system. Even though she was decannulated when she was two years old and she’s now ten, she still gets sick from cold or damp air quite easily. The upshot of all this is that when we go camping, we go “glamping” — glamorous camping, i.e. camping not in a tent but in a cabin. 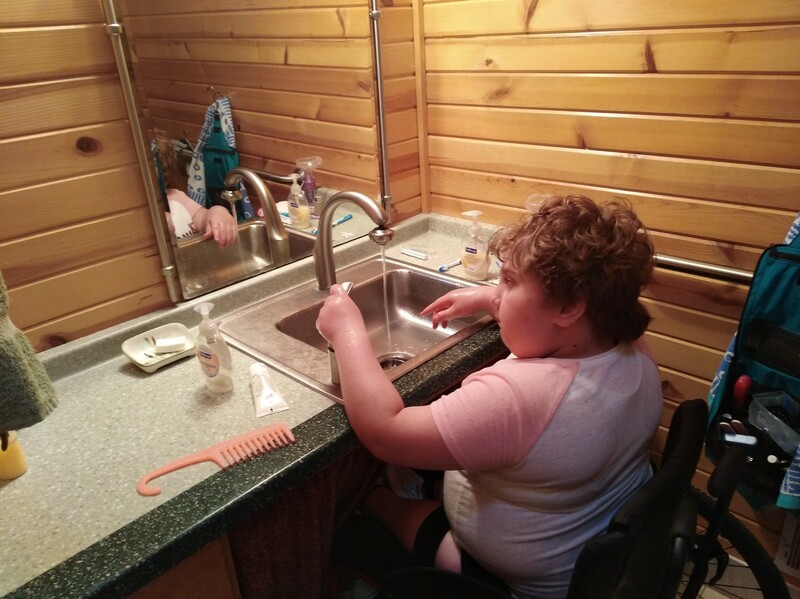 My aunt rented an accessible cabin for us at Richard Bong State Recreation Area for a week, and now that that week is over, I want to share a little bit about it. It’s pretty typical for any house or cabin to have a step up at the entrance. 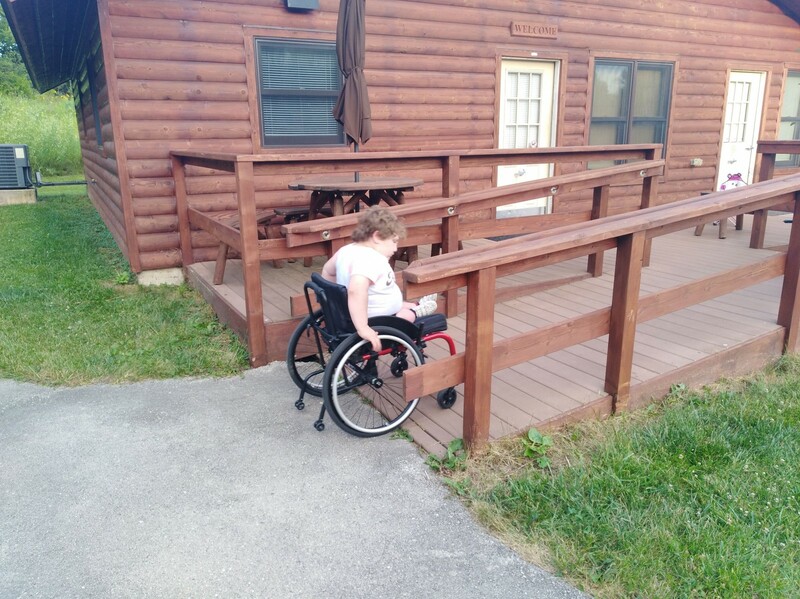 It goes without saying that an accessible building would have a ramp, but some places have pretty steep ramps. Fortunately, that’s not the case here. The ramp was shallow enough for Namine to wheel up comfortably. All the doors leading inside the cabin have a handle in the middle of the door. 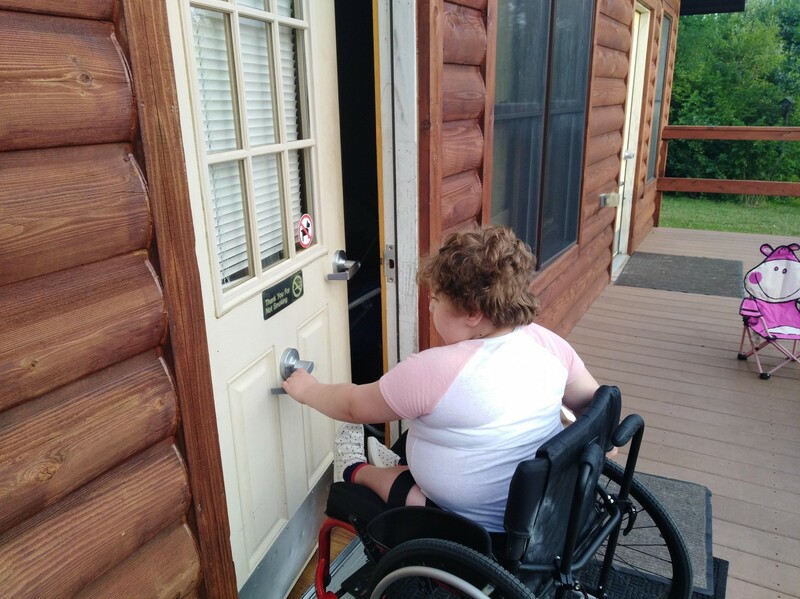 They’re not working door handles to open the door; rather, they’re so a person in a wheelchair can easily close the door behind them without banging the door into their chair. The cabin’s bathroom doesn’t have a bathtub. Instead, it has two shower heads, one set on an adjustable slider so that it could be moved up and down. In most bathrooms, even appropriately labeled accessible ones, the faucet handle is on the far end of the sink. Not so in the cabin, where the faucet handle is near the front and to the side. It was like this both in the bathroom and in the kitchen, making it much easier for Namine to turn the water on and off.